BeST_Visual MAs Signal Generator MT4 Indicator is a very useful Visual Tool that can display in the Chart all ENTRY signals (BUY and SELL) and also any corresponding EXIT signal, based on a total of 12, common but also different trading strategies, in which the Entry and Exit Signals are derived exclusively by using Moving Averages (MAs). 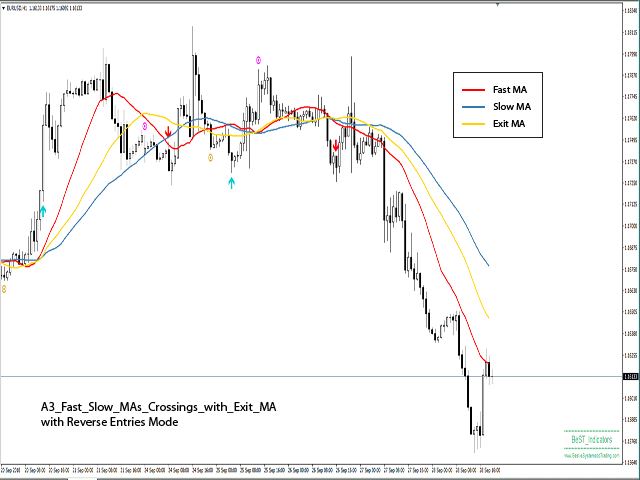 This group includes 4 different strategies (A1-A4), where Entry and Exit signals are based only on Crossings that occur between MAs or MAs and Price (Close). This group includes 3 additional different strategies (B1-B3), in which the Entry and Exit signals are based on the slope changes of the MAs included in each strategy. 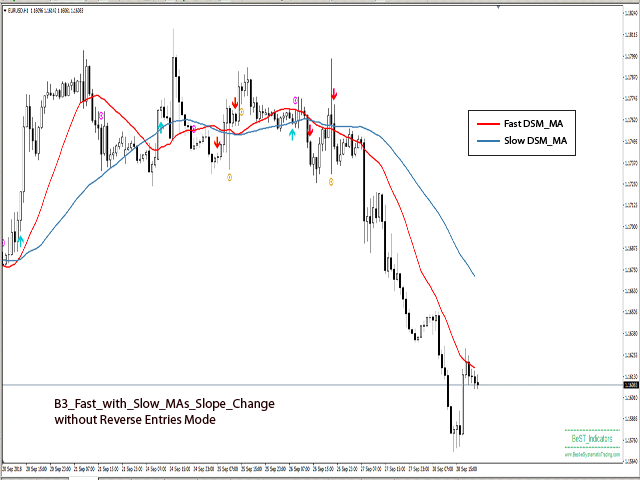 1) For 5 out of 12 total strategies, which by default are not Reverse, there is a choice of Reverse Entries Mode, so that the Exit signal from a position can be at the same time an Entry signal in the next opposite position. This, for example, is often very useful and possibly necessary, when the Entry conditions in the opposite trade appear before the default conditions for Exit, from the current open trade. 2) There is also the option to display or not in the Chart, the MAs used to produce the displayed signals. 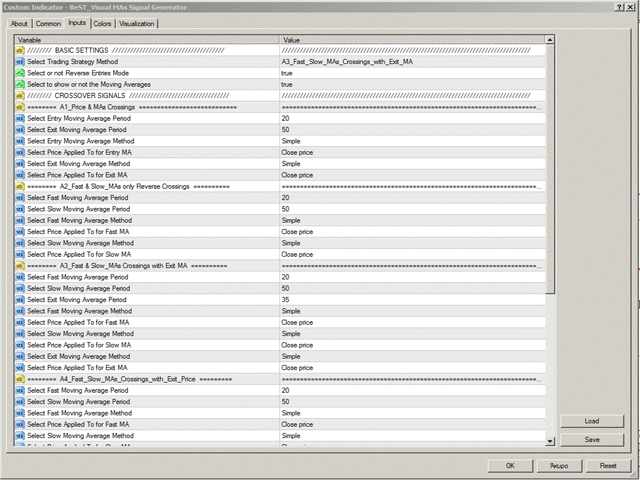 3) In the Strategies included in the tool, the MAs used are named according to their use or properties, as Fast and Slow or Entry and Exit MAs. • Select Trading Strategy Method: You can select the Strategy you prefer to use among 7 total different strategies. • Select or not Reverse Entries Mode: You can additionally select the Reverse Entries or not for the already selected Strategy. • Select to show or not the Moving Averages: You can also select if you want to see or not on the Chart the MAs that are used by the selected Strategy. All other Input parameters are simply selections of the Period, the Method and the Price applied to, for the MAs that are used by the selected Strategy. use only of Moving Averages. desirable Moving Averages either alone or additionaly the whole corresponding Strategy, which offers the possibility for discretionary-manual trading. Fixed problem with the signals' arrows that did not run.